The ideal starting point for coupled atmosphere-ocean general circulation models (GCMs) is the present climate; but there are not enough data, nor is there enough computing power, to commence a climatic simulation on the basis of this information. In an attempt to surmount these problems, climate models typically employ alternative approaches, such as parameterizations, spin-ups and flux adjustments that may introduce significant errors into the final result. Parameterizations are mathematical simplifications of highly-complex physical processes that are utilized in coarse-scale GCMs to reduce the computing power required to run global climate simulations. Such simplifications, however, render small-scale weather features such as hurricanes, thunderstorms, and tornadoes unresolvable, so that the models fail to accurately reflect many highly-important real-world phenomena. 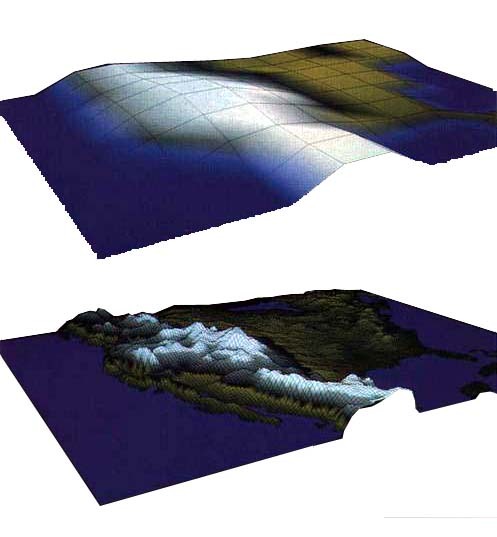 Consider, for example, the accompanying figure, which illustrates grid-size differences in two topography models. The top half depicts North America with a grid-size of 480 km that is typical of many GCMs. The bottom half depicts the same region using a higher-resolution 60-km grid that is typical of operation forecast weather models. When viewing these different representations, it is obvious that that of the 480-km grid model is severely restricted in its ability to portray North America's rich and varied topographic features. Likewise, it is similarly restricted in its ability to accurately represent all of the many energy transfers and feedbacks that operate on a variety of scales in earth's total climate system. The 60-km grid model obviously does better in these respects, but it still lacks the ability to model weather features such as thunderstorm cells and must parameterize many important energy transfer processes. Moreover, its higher resolution requires a computer power that is 500 times greater than that of the 480-km grid model. Consequently, caught between the rock of insufficient knowledge and the hard place of limited computing resources, most GCMs are forced to parameterize many important processes in both time and space. This retreat from reality is currently unavoidable; but it severely limits the usefulness of climate model projections (Hewitson and Crane, 1992a, 1992b; Von Storch, 1993; Von Storch et al., 1993). The lack of initial data has also led climate modelers to adopt a strategy of "spinning-up" the ocean and atmosphere sub-models separately, using arbitrary initial conditions, after which they are at some point linked; but this strategy ignores real-world transfers of energy, moisture and momentum that could significantly alter the results. In the words of the Intergovernmental Panel on Climate Change, "ocean models present special spin-up problems since, when forced with specified fluxes, they typically arrive at an unrealistic state because atmosphere-ocean feedbacks are absent" (Houghton et al., 1996). In coupling atmosphere and ocean sub-models, the climate drift produced by the separate spin-ups must thus be ameliorated by a "flux adjustment," in which the surface heat fluxes are modified by a "correction" or "adjustment" term (Houghton et al., 1996). Such adjustments, however, are physically unfounded and often of larger magnitude than the climatological mean fluxes (Manabe and Stouffer, 1988; Saussen et al., 1988). In some models, in fact, flux corrections in certain regions exceed 200 Watts per square meter (Gates et al., 1993; Houghton et al., 1996), which is 50 times greater than the surface radiative forcing, or impetus for warming, predicted to result from a doubling of atmospheric CO2! The incorporation of flux adjustments into coupled climate models highlights their lack of climate realism and is a manifestation of "outward symptoms of underlying systematic errors in the uncoupled models" (Houghton et al., 1996). Other studies also suggest that flux corrections may seriously affect the simulated climate signals (Nakamura et al., 1994; Neelin and Dijkstra, 1995; Pierce et al., 1995); and if flux adjustments are needed to simulate the present climate, there is little reason to believe that the models that employ them can successfully simulate future climate. So what does the future hold in terms of predicting changes in climate? If it bears any resemblance to the past, we can expect to see continued advances in computer processing, as well as better and more realistic physical and chemical parameterizations of real-world meteorological phenomena. As is suggested by one study (Gregory and Mitchell, 1997), we will probably even see the need for flux adjustments eventually disappear. What, then, will be the product of these next-generation computer simulations? No one knows for sure. But if historical trends hold true, we will probably see the predicted warming due to an increase in atmospheric CO2 continue to drop, much as it has in the past, with each new improvement in the climate modeling enterprise (Houghton et al., 1990; Houghton et al., 1996; Gregory and Mitchell, 1997). Gates, W.L., Cusbach, U., Meehl, G.A., Mitchell, J.F.B. and Stouffer, R.J. 1993. An intercomparison of selected features of the control climates simulated by coupled ocean-atmosphere general circulation models. WMO/TD No. 574 (Geneva). Gregory, J.M. and Mitchell, J.F.B. 1997. The climate response to CO2 of the Hadley Centre coupled AOGCM with and without flux adjustment. Geophysical Research Letters 24: 1943-1946. Hewitson, B. and Crane, R.G. 1992a. Regional-scale climate prediction from the GISS GCM. Paleogeography, Paleoclimatology, Paleoecology 97: 249-267. Hewitson, B. and Crane, R.G. 1992b. Large-scale atmospheric controls on local precipitation in tropical Mexico. Geophysical Research Letters 19: 1835-1838. Houghton, J.T., Jenkins, G.J. and Ephraums, J.J. (Eds.). 1990. Climate Change: The IPCC Scientific Assessment. Cambridge University Press, Cambridge, UK. Houghton, J.T., Meira Filho, L.G., Callander, B.A., Harris, N., Kattenberg, A. and Maskell, K. (Eds.). 1996. Climate Change 1995: The Science of Climate Change. Cambridge University Press, Cambridge, UK. Manabe, S. and Stouffer, R.J. 1988. Two stable equilibria of a coupled ocean-atmosphere model. Journal of Climate 1: 841-866. Nakamura, M., Stone, P.H. and Marotzke, J. 1994. Destabilization of the thermohaline circulation by atmospheric eddy transports. Journal of Climate 8: 57-80. Neelin, J.D. and Dijkstra, H.A. 1995. Ocean-atmosphere interaction and the tropical climatology. Part I: The dangers of flux correction. Journal of Climate 8: 1325-1342. Pierce, D.W., Barnett, T.P. and Mikolajewicz, U. 1995. On the competing roles of heat and fresh water flux in forcing thermohaline oscillations. Journal of Physical Oceanography 25: 2046-2064. Sausen, R., Barthel, K. and Hasselmann, K. 1988. Coupled ocean-atmosphere models with flux corrections. Climate Dynamics 2: 154-163. Von Storch, H. 1993. Inconsistencies at the interface of climate impact studies and global climate research. In: Biometeorology. A.R. Maarouf, N.N. Barthakur and W.O. Haufe (Eds.). Proceedings of the 13th International Congress of Biometeorology. Calgary, Canada, September 12-18, 1993; Part2, Volume 1, pp.54-87. Von Storch, H., Zorita, E. and Cubasch, U. 1993. Downscaling of climate change estimates to regional scales: An application to winter rainfall in the Iberian Peninsula. Journal of Climate 6: 1161-1171.